For most people, you could spend your entire week off on vacation traveling between different doctor’s appointments. First stop at your cardiologist for your heart, then your pulmonologist for your lungs, gynecologist for your well woman check-up, podiatrist for your feet, and on and on. Not only is this approach time consuming, but it gives patients fragmented care. No one is stopping to look at the entire person and put the whole picture together. Also no one is coordinating care between all the different specialists in the medical system. Why not go to one place that can take care of all your health concerns? If you have ever wondered this, you need a family physician. 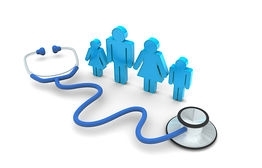 What is a family physician you ask? They are also referred to as family medicine, family doctors, general practitioners, or your PCP (primary care physician). Unlike other physicians who specialize in treating one specific organ or disease, your family physician is uniquely trained to care for you as a whole person, regardless of your age or gender. 1. You can have one doctor, rather than ten. Family physicians can replace that trip to the urgent care or ER for sick visits or simple injuries, and also follow-up on chronic medical problems, such as high blood pressure and diabetes. They also can provide routine healthcare screenings and counseling to help prevent diseases and keep you healthy. 2. You will feel better and live longer. It is proven that family physicians improve health outcomes. Catching anything and everything early is always the best medicine. This translates into reduced mortality, decreased hospitalizations, and reduced health care costs. 3. You will get a holistic approach to your care. Family physicians tend to take the long-term view on your health, wanting to keep you as healthy as possible for as long as possible. This also means treating your physical, mental, and emotional health. 4. One visit can take care of the entire family. Family physicians treat that entire family, from newborn to geriatrics. They provide pediatric care as well as adult care for men and women. So, one stop at the doctor’s office can take care of all sick members of the family, or physicals for everyone, without the need for multiple trips to the doctor’s office. Most insurances now require you to have referrals to see specialists. Also, some specialists want you to have imaging (CT scans or MRIs) or blood work testing done before your appointment to see them. Your family doctor can take care of these tasks for you. They also can coordinate care between specialists to ensure all testing you need is getting done, and no medications prescribed by different doctors are interacting or causing problems. 6. You have a place to just focus on being healthy. You need a health care provider to provide routine screenings and preventative services to just focus on keeping you healthy. This helps you catch issues early. 7. You will have a physician patient relationship. Having one physician that you get to know can offer a lot of benefits. You will feel more comfortable, and will build trust in your care. Also, one physician seeing you over a period of time gives them a better idea of your health and your entire history. So, stop spending all your time traveling between different doctor’s appointments. Find a family physician in your area to help you take charge of your health.